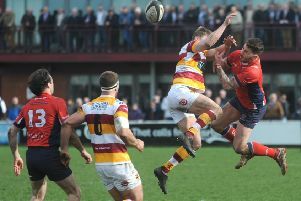 Tom Carleton is ready to step up to the plate as Fylde RFC’s emergency scrum-half, starting at Leicester Lions this weekend, though first-choice Cam Crampton’s ankle injury is not as serious as first feared. Full-back Carleton moved up to half-back when Crampton was stretchered off on only his third appearance for the club in the 46-8 win over Macclesfield last Saturday. The club feared a broken ankle but head coach Warren Spragg told The Gazette: “It’s a sprain, not a break, and the ligament damage is minimal. “He is up and about and has been at training this week. We’re looking at a few weeks out. “Tom Carleton has that X-factor and is a threat with ball in hand. “Scrum-half is a new role to him, though he played there a few times last season when Greg Nicholls was out. Second XV half-back Tom Forster is not an option after breaking his jaw last weekend, while a shoulder injury will again rule Nick Ashcroft out of tomorrow’s match at Leicester Lions. Back-rower Sam Dugdale impressed on his try-scoring debut against Macclesfield but his Sale commitments will restrict the dual-registered player’s availability for Fylde. But coach Spragg has no doubts the Woodlands club has the strength to cope admirably in his absence. He said: “There is no doubt about Sam’s quality. He is very robust and aggressive and has done well in each age group he has represented. Fylde head to the Midlands as the form side, Leicester having lost all three games and collected just one point. But while Spragg is satisfied with his side’s start, there is no question of complacency. He added: “We are traditionally a strong attacking side but we have the best defensive record in the league. But what we want is the best record after 30 rounds, not just after three. “We can’t underestimate Leicester. They have played good rugby and have been unlucky so far but we want to get in a winning habit.